The market is saturated with photography drones that come in different sizes and shapes. Each drone offers features that are important depending on the skill level and preferences of the user. If you are a beginner, factors including ease of use, maneuverability, and affordability are the important buying considerations. For intermediate and advanced users, more advanced feature and technology are pondered on. However, advanced features make a drone more expensive. We have chosen one of the best-selling drone photography today that is worth the price and appropriate for all users—the Contixo F18 Quadcopter Drone. Let us examine the notable features, pros, and cons of the Contixo F18 Quadcopter Drone to find out what makes it stand out among the other drones in the market. The Contixo F18 Quadcopter Drone is equipped with a global positioning system (GPS) that allows you to be aware of its exact location. It hovers accurately and instantly secures onto the satellites. 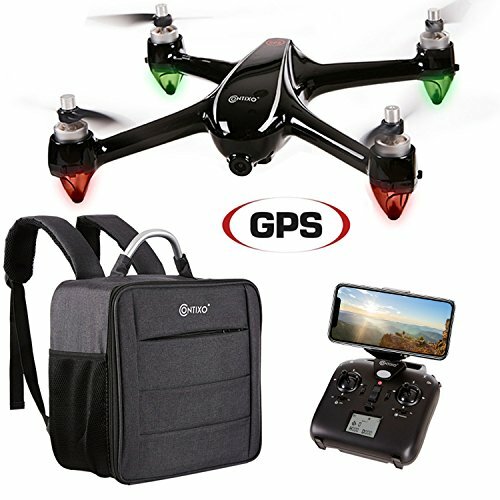 The GPS also makes it possible for the drone to automatically return to the base when the battery is low or when it is out of the signal range. No need to worry about your drone getting lost. Built with four powerful brushless motors, the Contixo F18 Quadcopter Drone can quickly increase or decrease its speed with less power consumption. This allows it to fly for 20 minutes. Compared to other drones in the market, the Contixo F18 Quadcopter Drone’s motor is 50% more powerful, and it instantly reacts to the controls. The Contixo F18 Quadcopter Drone is equipped with 1080p high definition live view FPV camera and 5.0 GHz WiFi band. This means that whatever the drone sees, you see it real-time via the Contixo F18 app. This app is compatible with both iPhone and Android. Make sure that the area is free from signal interferences like TV signals and mobile networks to guarantee real-time, non-buffering live feed. Contixo F18 Quadcopter Drone can fly as far or high as one mile. It is built with LED lights so you can easily monitor it when flying during the night. The Contixo F18 Quadcopter Drone has a feature that makes it friendly for beginners. The Headless Mode IOC is an intelligent orientation control that allows you to control the drone in basic orientations, such as moving backward, forward, right, and left regardless of the way it is facing. Moreover, the Contixo F18 Quadcopter Drone can easily take off and land in just one press of a button. It flies up to five feet high and can hold its place above. This feature is also beginner-friendly. The Contixo F18 Quadcopter Drone comes in a package that contains everything you need for ultimate drone photography experience. Among the contents of the package are the charger, drone battery, eight propeller blades, propeller changing tool, remote control, screwdriver, mobile phone clip, coverage card, installation guide, and instructional manual. All these tools are housed in a water-resistant carry bag for convenient storage and transport. The Contixo F18 Quadcopter Drone comes with four throttle control modes. Each mode suits different flying preferences of the user. The drone has two default modes and comes with additional throttle modes, the right-hand throttle and left-hand throttle for advanced users who prefer non-conventional control. The Contixo F18 Quadcopter Drone is an excellent choice for drone and photography enthusiasts, but you probably want to look for another alternative. Another great drone for photography that is worth considering is the Potensic Quadcopter Drone. Compared to the Contixo F18 Quadcopter Drone, this Potensic Photography Drone package is more affordable. The Potensi Quadcopter Drone is ideal for beginner users because it comes with basic features and controls that are easy to use and maneuver. In just one press of a button, it can take-off or land on the ground. It can also hover at a specific altitude when you discharge the throttle stick. With the steady altitude, you are able to capture good photos or record videos. What the Potensi Quadcopter Drone has that the Contixo F18 Quadcopter Drone does not have is it comes with VR glasses. With VR glasses, it gives an ultimate 3D experience and gives you a real-time live video. With the Potensi Quadcopter Drone is more budget-friendly, the Contixo F18 Quadcopter Drone has more features, advanced technology, and more powerful brushless motor. However, both come in a complete package and are suitable for both beginners and experienced users. In the end, the decision lies upon whether you care about the motor power, technology, and price because these are the major differences between the two photography drones. Overall, the Contixo F18 Quadcopter Drone is an excellent photography drone for types of users who need a complete drone package and do not mind spending a little more than just a basic drone set. It is made with a powerful motor that quickly speeds up or down while pressing the control button. This motor is 20% more powerful compared to other drones in the market and can fly for up to 20 minutes. When the battery is low, the Contixo F18 Quadcopter Drone automatically returns to its base. Amazingly, this technology is made possible by the GPS installed in the drone. The camera provides real-time images with up to 1080p HD quality, especially in a signal interference-free environment. These two factors are the notable features of Contixo F18 Quadcopter Drone that other drones don’t have. The photography drone allows you to capture high-quality images and videos from up above. For its advanced technology, power, camera quality, and price, the Contixo F18 Quadcopter Drone is the excellent photography drone for both beginners and advanced users.